All the useful information that you need to know before sending money with PostOffice! Post Office Money is one of the largest retail networks and financial services chain having over 11,500 branches nationwide as well as 47 million transactions per week. The company offers various services including mail & retail, financial services, government services and telecoms. In money remittance, it offers two types of transfers, one is online transfer and the other is Post Office Transfer via MoneyGram Money Transfer. These are the online transfers offered by the company which can be completed using the UK registered bank account, debit or credit card. If you are transferring the funds above £20,000, you need to speak with the customer service team. Here, you can set regular payments so that they take place weekly, monthly or any period that suits you. For this, call on 0800 180 4809 and the specialist team of the UK Post Office will set this up for you. This is an offline transfer, but offer instant transfers over 350,000 locations worldwide. The customer who wants to use this service has to visit the nearest MoneyGram branch with their ID proof, fills the send form and hand it at the counter. This helps in making the transfer quicker. It also offers MoneyGram Plus card to the customers who repeat the transactions to make it faster and easier. The Post Office MoneyGram accepts cash and debit card for making payments. It also offers that you want to pay fees separately or includes in the total amount you have paid. You can locate the Post Office MoneyGram branches here. On customer support, the company does not offer 24*7 customer assistance; one can call them in the business hours or either can send the query through email. Pricing : How much does PostOffice cost? The company does not charge any fee for an international payment; however, there will be a mark up in the exchange rates, which will be still better than many of the banks. The company offers mid-market prices depending on the amount you want to send and the country you are sending funds to. You can see the exchange rates at the Post Office International Payments calculator here. If you transfer the funds through any card, then you may impose some additional charges. So, we rate Post Office Money 8 out of 10 for its pricing policies and exchange rates. Transparency: Does PostOffice have any hidden fees? The company does not charge any hidden fees. The amount which will be shown to you on the transaction page will be received by the beneficiary. At the same time, it also locks the exchange rates once you start the transaction. The company offer tracking details on the dashboard of the users. So, those who have to track the transfer need to log in and look after where the money has reached. Therefore, under the transparency head, we rate it 9 out of 10. 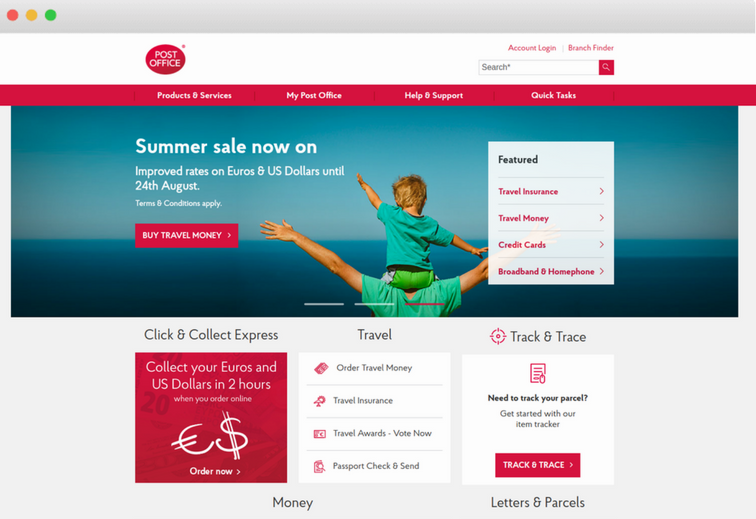 Transfer Speed: How long does it take to send money through PostOffice? The transfer speed of your money depends upon which service of Post Office Money Transfer you are using. The transfer through MoneyGram takes a few minutes before they are available to the recipient. So, it is an instant and fast transfer service of it. Although, this service is might charges an extra fee for transferring funds faster. This is a bank account transfer, which takes at least 3 working days to land the funds in the recipient’s account. So, on its transfer speed, the experts of Exchange Rate IQ give it 8 out of 10. Security : Is PostOffice Safe? Post Office Money is an easy and secure way to transfer the funds internationally. The services under it are provided by TTT Moneycorp Ltd. The company is regulated by the Financial Conduct Authority of the UK. The provisions of making payment are made under the Payment Services Regulations 2009. It uses Symantec SSL security on its website to protect it from any online threat. The company also uses a web site recording service that record mouse clicks, mouse movements, page scrolling and any text keyed into website forms. Henceforth, it is highly secured and we rate it 10 out of 10 under this head. The company is offering both Android as well as iOS apps. You can download the apps here. The company offers £20 M&S Gift Card to the user when they recommend the services of Post Office Money to friends and then they transfer a total of £5,000 over 12 months. The company offers promo codes to its users through notifications, email and SMS. Users can use these promo codes while making payments to get a discount on the transfer fee. On the overall user experience, we rate it 8 out of 10. To use the services of Post Money Office Sign Up here. Coverage: How many Countries & Currencies does PostOffice support? At these places and currencies, you can send funds through the UK authorised bank account, debit or credit card. You cannot use any other country’s card or money market instruments. Therefore, we rate it 8 out of 10 in coverage head. So, if you want to use the services of Post Office Money login here. No stars would be better! I paid in cheques for around £300K 10 days ago and I need the money to pay bills. Not only have the funds not cleared but the issuing authority has told me that the cheques have not even been presented. Talk about incompetent! you'd have thought that they'd have got hold of the money in moments and sat on it for a while before clearing it down. After all, that's how banks make money from transfers. The worst thing was that there was no way of contacting the post office in real time to chase this up. It all had to be sorted out by me, my bank and the issuing bank (First Direct Bank and Metro Bank) both of which were brilliant.It's not the post office staff at the counter - no problems there - it's the organisation and customer service. Ha! What service? Never again! Absolutely appalling , Didn’t knock on door . Said they tried to deliver but I was in , had to get redelivered 3 days later as working , Said it’ll be here by 3pm . So I. A sunny day with 3 kids I’ve stayed in all day, 3.30 still no delivery , small print says even though we say 3 it it doesn’t get to you by then it can be anytime ??? Now been on phone to customer services for 50mins still no human contact , in a que but don’t say how many , Such a big company probably why service is so poor, Hopefully with all other players in the market and continuous cost rises with Royal Mail the see their busines go down hill, How they have a royal crest is beyond me Royal , please !!!! Living in the past. Signed mail is a joke. Not in? well perhaps you'd like to collect it from 5 miles away. Another option? no, you've had your chance. Get with the times Royal Mail...Amazon and DPD are going to eat you alive now that you're no longer indemnified by our dufus government. Going the same way as BT. ABSOLUTELY TERRIBLE. AVOID AT ALL COSTS Word of warning to anyone considering broadband and line rental with the PO: Don't. They won't cancel when you ask them to and when you call them up to explain this, they ask "so what's the problem?" BEYOND INCOMPETENT. Can't imagine they will go on for much longer. Tydd Gote Post Office 5 stars all the way! Absolutely fantastic family run rural small business. I recently had to post a parcel to the USA. It was small but heavy. At Basingstoke Post Office I was told the only option was via Parcel Force Global Priority at a cost of over £80. I'll say that again. £80+!! I walked out and later, after shopping online, found that I could post by the exact same service with Parcel Force for £36!! The Post Office is robbing people that can't shop around - and this will be the poorer customers and elderly people. It is disgraceful and a national scandal. worst service !! I took a policy with them but after one year they automatically renew even though you did not opt for auto renewal. My premium doubled after 1st year. Took me 35 minutes to get to one of their customer services team to get it cancelled. Would not go with them ever. I use both local post offices and have always found the staff helpful and pleasant to deal with and recommend them to everyone. I signed up to Post Office home phone as it was supposedly cheaper than my BT package. I signed up to the anytime calls package which in my terms and conditions states it is calls to any number 7 days a week, 24 hours a day. I noticed my bills were actually now more expensive than with BT so I phoned up the Post Office customer services and made a complaint. They said that this package did not include calls to mobile numbers. They have since introduced a new package called anytime calls plus which includes calls to mobiles. This is not what my terms and conditions stated and it has left me in a worse position than I was with when I was with BT. This stinks of bait and switch where a company offers one product but then instantly switches you onto a more expensive package to give you what you thought you were signing up to in the first place. According to dictionary.com... "the action (generally illegal) of advertising goods which are an apparent bargain, with the intention of substituting inferior or more expensive goods." Exactly what has happened here. Shiela at your Westminster Bridge Post office provided exceptional customer service for me in advising me on how many dollars I needed for my trip. She did it all with a calm reassurance that was not only helpful but made me want to use them again. The staff at the main post office in Kendal are rude , unhelpful and the service is shocking . Avoid if possible. I sell clothing on Ebay and post items 2 or 3 times a week. When the prices went up on 25th March 2019, I first did not pay attention of the increase of postage. I went to the post office today to send 2 large letters. I paid £3.00. Usually because I have a mixed of items I do not pay attention. This time, I was sure that I used to spend £1.01 for each of that item. On my ticket, it is written that the letter weights 0.114g. I weighted the item I sent and with all the packaging and sellotape, it weights 0.70g. The Post Ofice I went in today cheats with their scale. We are not able to see the weight ourself. Next time I will go I will confront the cheat. For the last 10 years, I always check the price before going to the Post Office because I had noticed many times that they don't give you the best price at the counter. I always say to them that I want to pay the cheapest rate, like this they cannot say later that they did not understand my request when I confront them. Because they will say, I thought you wanted a fast delivery or whatever. The Post Office to not serve the people, they always try to get the most money they can. It is just a rip off. Check the dimension, the weight and the price online before going to the post office. Oherwise, you are sure to be scammed. Six months without a post office and counting. Unacceptable. The post office in Denham (Station Parade) stopped service around 6 months ago. To my amazement they are still not working. Why on earth has the post office not made alternative arrangements. What the hell is wrong with you. This is totally incompetent and unacceptable. There is a lot of housing for retired and elderly people in the area and this slack approach is totally irresponsible. You don't deserve even one star. The staff at local branch are either good.... Or simply not there. The queue times are horrendous, and one of the staff there is incredibly rude. Why are there never enough staff working there to cover all the tills? I went to the Chesterfield PO to renew my photo card driving license and was told that the photo booth was broke. This wasn’t the case at all they just didn’t have the staff to cover the counters. When this PO was a Crown PO the service was always to a good standard. Took them 2 months to process my credit card application by which time the transfer I had requested was £200 too high. I was told that I couldn't cancel the transfer without having a card number, but by the time the card arrived I was told that it was too late to cancel the transfer!!! I was passed around staff that all gave contradicting information, the first person being incredibly rude to me. Absolutely appalling service, after having the account for less that 24 hours I have already applied to get a credit card with a different company in order to cancel my card with them. Avoid avoid avoid!!! Only been a customer for a week yet we are already without internet. How can a company be this bad. It's shocking. I called them this morning to let them know there was a problem and it's now almost 5 in the afternoon and it's not fixed. I hope they know I'm not paying for a service ive not received. Please read reviews. Do not get broadband with the post office. I wish I had takeny own advice. Go to the Post Office website. Click on “Products and Services” at the top and then select the “International Payments” under Banking head. Here select your and beneficiary’s currency as well as enter the amount you want to send. You will get the exchange rate. Here you have to enter all the details asked by the company. Create an account, provide your and recipient’s bank account details. Re-check the details and complete the transfer.